The picture shared here in this web post, was shot in year 2007, and is from Bricksnmortar Edesk's own pic library. It is the upside shot of a commercial building's dome roof's underlay design that was very unique that point of time. The commercial building in subject is City Plaza building located in the Kingdom of Saudi Arabia. 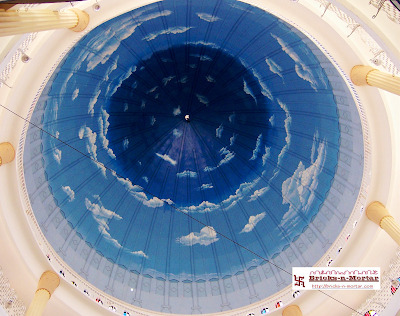 The colours and design chosen in the dome look awesome in reality providing a sky-like texture to it. The huge size of the dome roof renders it a quite large expanse on which the design augments very well. The captured picture's clarity does not do due justice to the design. In case anyone has a clearer, brighter, crisper image of this dome roof's underlay design, do share with all of us. Interesting. Wonder if the inside of dome would be designed to light up by intelligent artificial lighting during the day to render natural daylight effect!